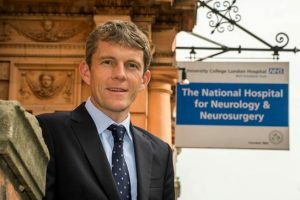 Dr Dominic Heaney is a consultant neurologist at The National Hospital for Neurology and Neurosurgery at Queen Square and UCL Hospitals NHS Foundation Trust. In addition to his NHS practice, he has a private practice based in central London. As a consultant, he has treated patients with neurological conditions in one of the busiest neurological centres in Europe for over 10 years. Over this period, he has set up and now directs the hospital’s first seizure clinic, instigated the UK’s first obstetric-neurology clinic, and more recently a established a community-based neurology clinic based in Camden diagnosing and treating ‘hard to reach’ patients who might not be able to access hospital services. Many neurological problems you might be concerned about (for example tremors, odd or persistent headaches, problems walking, unexplained seizures, blackouts or funny turns) prove to be simple to resolve. However, using his diagnostic expertise and immediate access to NHNN’s world-class scanning, laboratory and neurophysiological and therapy support, Dr Heaney is happy to assess and organise treatment for even the most complex of cases. How can a neurologist help me?